Let’s just get one thing out of the way before we dive into the review of this model-don’t let its appearance throw you off! Seriously. It would be very easy to dismiss the NuWave Precision Induction Cooktop (PIC2) as a ‘cute’ well-designed compact ‘toy.’ It’s very tempting to just think that this TV-publicized unit is just one of those well-promoted devices you see in late night infomercial channels that are long on the hype and short on actual delivery. Well, you may be tempted to think along those lines but an in-depth analysis of this model reveals actually delivers a shock-it lives up to the hype. Indeed, it does quite well with both value and comparative analysis that it is very tempting to get so excited about this model that you might think it is the best portable induction burner. Well, before we get too excited about this small induction cooktop, it would be very helpful to filter its features through objective criteria. Before we launch into the formal review, it is worth taking some time to quickly do a rundown of why we used the following criteria to size up this model. These criteria were not chosen by random. They form the most common objective standards consumers looking to buy induction cooktops focus on when trying to make an informed decision. We ran the NuWave Precision Induction Cooktop (PIC2)’s features through the following criteria to determine if it is worth picking up. We considered this model’s heat range, portability, control ease and intuitiveness, how easy it is to clean up, heat quality, and how versatile it is in accommodating different types of cookware. We are happy to report that, despite its small size and seemingly gimmicky appearance, this model knocked the ball out of the park for most of these criteria. 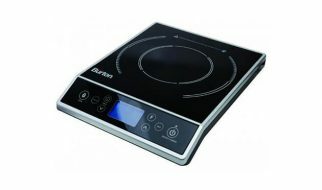 For any cooktop to be serious contender for the title of best induction cooktop, it has to deliver solid heat. Well, this NuWave unit does just that-you get a very precise temperature control system. Starting out at 100 degrees Fahrenheit and topping off at a very impressive 575 degrees Fahrenheit (most other induction cooktops in its class top out at 450 or 475 degrees), you also get to scale this range at highly precise increments of 10 degrees. Impressive indeed! Whether you’re warming something to flat out searing food, this cooktop has your covered. instantly qualify it for the ‘most portable’ induction cooktop unit but, if you dig deep, this is just the right mix of weight and dimensions. How come? Well, you wouldn’t want a super lightweight induction cooktop. The closer you get to 3 pounds, the higher the chance you might injure yourself using that induction cooktop. Why? The unit might be so light that it can easily slide when you’re cooking. This can cause all sorts of problems if you’re boiling water or handling something super hot. Also, you wouldn’t want a footprint that is so spare that it can barely accommodate a decent pot’s bottom. The width of the unit must be big enough to handle the dimensions of most induction cookware. In addition to the angled face of its control panel, this unit highlights control and precision. Well, you get quite a bit of control by being freed from the common problem faced by too many induction cooktops with flat controls-spill management. Thanks to its angled face, this Nuwave model won’t leave you guessing because you can always see the LED display of the controls regardless of whether you’ve spilled on the cooking surface or not. This comes in quite handy during boils. But this is not the clincher for this device. What really made us sit up and pay attention to the NuWave’s control system is its programming technology. Seriously. You can set up 100 hours of settings. Whether you are cooking very easy to prepare foods or you’re cooking something super fancy, this unit’s state of the art program setting technology is more than up to the job. It is no exaggeration to say that this NuWave model has taken delayed timing or timed cooking to a whole higher level. Of course, no timed or delayed cooking function is complete without an automatic shutoff feature. This model has such a feature. Again, impressive. We can tell that, just judging by its control elements and features, this model is aiming hard to be considered the best portable induction cooktop of at least its class. As mentioned above, this model sure is a contender for the best rated portable induction range or the best range portable induction cooktop. Why? Well, it is so easy to clean up. It’s angled face design ensures that any spills or accidents on the cooktop won’t blur or obscure the controls and LED readout of this unit. This would enable you to quickly adjust temperature settings or shut down the device altogether. Also, its coating and smooth surface and general absence of recesses and indentations makes sure that spills won’t cake or get stuck in hard to reach spots. This makes cleanup as simple and basic as wiping the unit’s surface down with a damp cloth. Nice and easy! 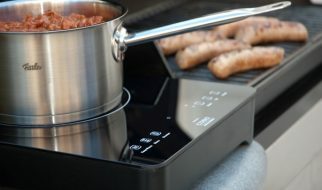 Boasting of a large cooking area (9 inches), this model seems designed to deliver the right amount of heat at the right place at the right time. During our testing, this NuWave device was able to do just that. Best of all, its circular, almost out of this world appearance, actually had a very practical effect since no surface area is wasted. It cuts out any possible dissipation space for the heat it generates. 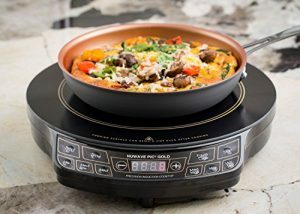 Given this eagle eye attention to space and heat efficiency, it’s easy to see why many people consider this model the best buy induction cooktop for them. It is also easy to why it comes out as the best rated portable induction cooktop among many users. Given its large heating surface, you are assured that whatever pot or pan size you deal with, this model can do a decent job. Also, NuWave’s heating technology is sensitive enough to accommodate all ferromagnetic compounds mixing aluminum, ceramic, copper, and other compounds mixed with iron. Since NuWave is known for its solid customer support as well as its great designs, the low price of this model just seals the deal. Whether you’re looking at design, heat quality, price, or portability, this model knocks it out of the price. It definitely offers the best price for induction cooktops if you look at the value it brings to the table. It also appears to be the best price induction cooktop value. Check it out today. Check out our Induction Cookware Reviews!